First of all, there is your Tilpy portfolio. It's the place where you can showcase your best works and where you can demonstrate to our photo buyers that you are a pro photographer. Along with your portfolio you have the option to provide much more details about you as a photographer, such as: your CV, your studio and equipment and an About You page. And how does your portfolio help you growing your business? By the way, we allow clients - they must be logged in - to contact you directly on your portfolio page via the 'contact me button'. This feature is of course free of charge, just like your portfolio and Tilpy membership. One of the most interesting buyer demographics for photographers is design and marketing agencies. 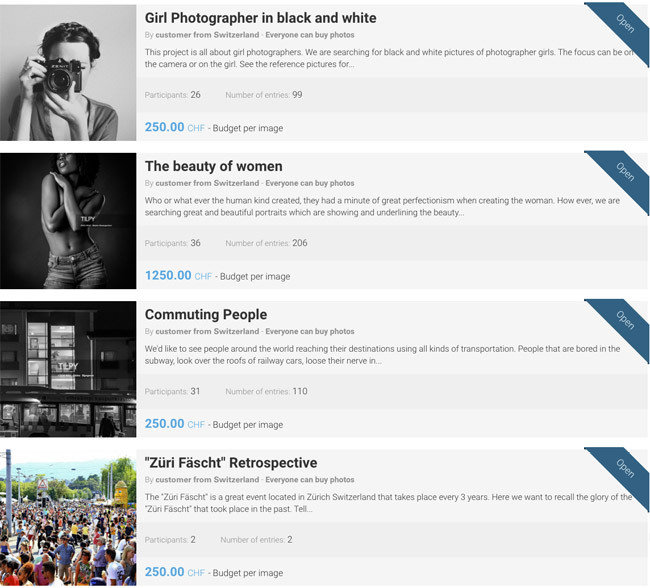 These people typically spend (read: waste) lots of time and resources on finding the right image, and that’s where Tilpy helps you as well as the buyer. Our Photo projects service allows a buyer to simply post a request (a ‘Project’) that describes what they need, and you the photographer simply present your most relevant shots. They save time, you get to be front and center for a buyer who needs exactly what you have. A client briefs us on the kind of picture and license he needs. After that, we inform you about the request. Such a “one client project” is time limited and therefore there’s a picture submission deadline. If you already have the requested picture on your hard drive and the terms are suitable for you, then you can submit it. If your picture gets selected by the client, a written and binding license agreement between you and your client will be set up. Only the client who gave us the image brief can buy a submitted picture during the submission timeframe. The client is not obliged to buy a submitted picture. 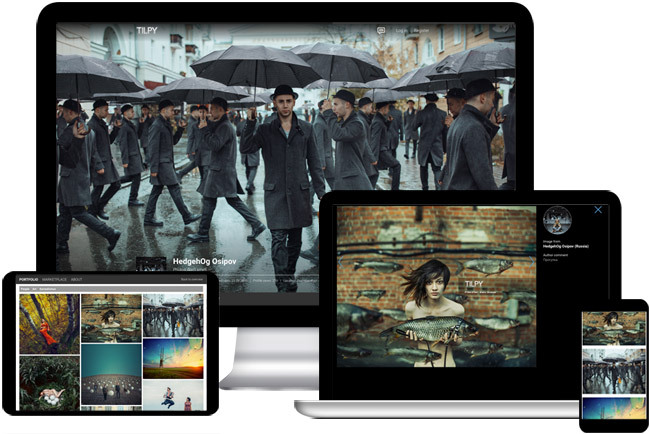 Tilpy also sets up picture stories. Think of it as an ongoing story, where each new picture becomes part of the storyline. We send you a brief that tells you what kind of pictures we are looking for. Such a “story project” is not time limited and has therefore no submission deadline. If you have already the right requested picture on your hard drive, then you can submit it for the licenses you would like to sell the image for. We at Tilpy then try to sell your images to potential clients. When a client buys a submission of you, a written and binding license agreement between you and your client will be set up. From these “Story Projects” our creative team derives Tilpy Collections, where the best submissions get uniquely featured and promoted. 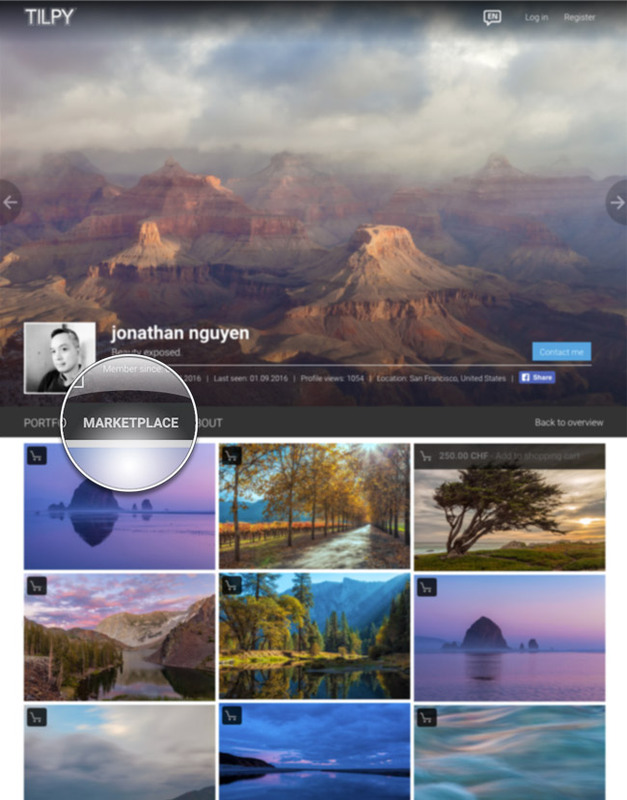 See example Tilpy Collection "Your City By Pictures"
Your Marketplace is where clients can buy pictures from you directly, without setting up a project. Your Marketplace is part of your public Tilpy Profile. Only submissions on “One Client Projects” and “Story Projects” are getting into your marketplace. They are only for sale within the license you agreed upon. We currently do not allow to upload pictures right into the marketplace, but that will be soon possible too!